It’s always hard to tell a whole story in one short film so that the audience comprehends it completely. When a filmmaker tries to examine a difficult, or rather, a dysfunctional relationship between two brothers, this is, you might find, almost an impossible task to perform. However, writer/filmmaker/producer Dusty Mancinelli seems to have no issues in studying human behavior at a certain level in his new short film, WINTER HYMNS. He touches on an interesting subject matter: Is there any way to repair a damaged relationship? Believe it or not, Mancinelli’s answer to this question is only too clear for us to learn from it. 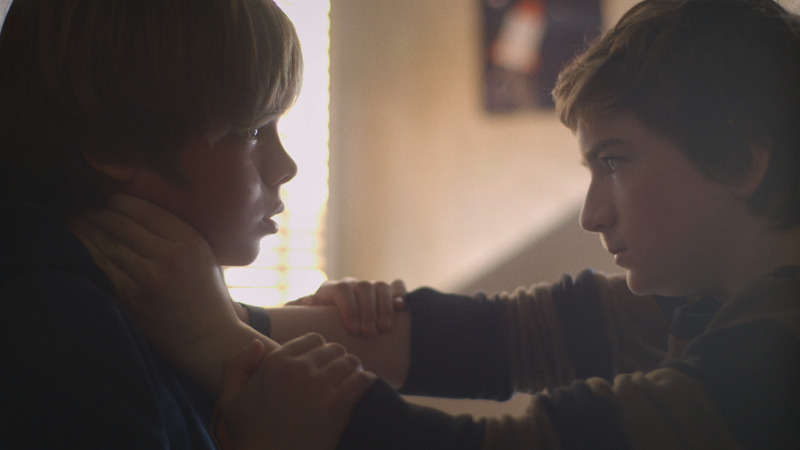 Cain orders his twelve-year-old brother, Joshua, to hold still while he squeezes Joshua’s neck with his two hands, to test Joshua’s endurance. But soon, Joshua reaches the level Cain, his beloved brother, had wanted, but not in a way they both expected. It’s a harsh winter and Joshua finds himself forced by Cain to go out for a dangerous and life-changing adventure. While Joshua tries to earn the affection of Cain by performing the task faithfully, Cain seems not to be satisfied. He sends Joshua again to break into an empty cottage to grab some alcohol. Joshua has bad feelings about it, but obeys the order. When Joshua does not return, Cain goes out to look for him, and what he finds is something he was not ready for…. With a running time of 15 minutes, WINTER HYMNS brings you right to the point where you find an unusual relationship between two brothers. Cain is a violent young man who does not know when to stop, and Joshua can’t resist him. They both suffer from a dysfunctional relationship that can’t make them think clearly. Having so much freedom, the brothers try to prove something to each other, so much so that the price they later pay is not worth it. Mancinelli takes on a difficult subject to explore how to restore an impaired relationship, but once you see his solution, you realize you would not wish to see another solution other than the one “generously” offered by the filmmaker. WINTER HYMNS is a well-crafted film whose approach is philosophical, rather than material. It gives you food for thought, as you watch how the relationship between Joshua and Cain unfolds. It’s clear to the audience that what had started on the screen is not going to end well. But at the end, we understand that it’s the only way for Joshua to understand that “you always get burned when you play with fire.” Unfortunately, it will be too late for Joshua to learn the lesson. That is, if he ever does….